Today, October 5, marks a critical deadline for thousands of young immigrants who’ve benefited from the Deferred Action for Childhood Arrivals (DACA), also known as “Dreamers,” for the last several years. Last month, the Trump-Pence administration made the cruel decision to rescind DACA, putting roughly 800,000 Dreamers at risk of deportation. The announcement will put an end to the five-year-old program in less than five months. Dreamers across the country, whose DACA is expiring between September 5, 2017, and March 5, 2018, have until October 5 to renew their DACA applications; this deadline leaves hundreds of thousands Dreamers vulnerable to deportation. The demand for renewal has been lower than anticipated due to the lack of information about the date and growing fear among Dreamers to disclose personal information. All DACA renewals must be submitted to the United States Citizenship and Immigration Services today. You DO NOT need to complete the whole application if you are applying for renewal. Watch this video to learn more about DACA renewals. 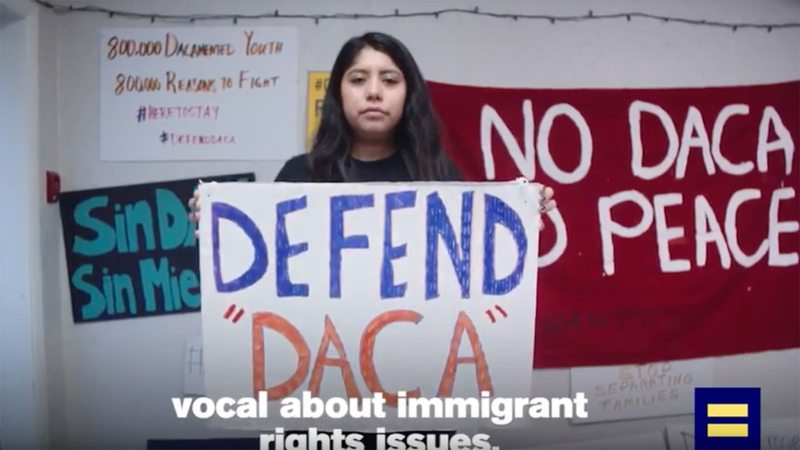 DACA has allowed young immigrants -- including an estimated 36,000 LGBTQ Dreamers who have benefitted under DACA -- who entered the U.S. as minors, to stay in the country, continue their studies and work in the U.S. Since the administration’s decision took place, Dreamers are relying on Congress to act on their behalf to obtain legal residency status that would enable them to stay in the country they call home. HRC sat down with Erika Castro, an LGBTQ Dreamer in Nevada, who was brought to U.S. from Mexico as a child. As a DACA recipient, Castro has been able to earn a college degree and work as a community organizer with Progressive Leadership Alliance of Nevada. Ending DACA is cruel and wrong. HRC has endorsed the bipartisan 2017 DREAM Act (H.R.3440/S.1615), which would provide a path to citizenship and stop the deportation of Dreamers. HRC will continue to stand with Dreamers and fight for the rights of LGBTQ immigrants, Muslims, refugees, people of color and all the vulnerable communities. So far, more than 13,200 of HRC’s members and supporters have called their lawmakers in support of a clean DREAM Act. Join them in making your voices heard. Text “DREAMERS” to 30644 to be connected to your Representative’s office.